ABS Brakes - Resetting the computer. remove wire from SCART Plug and close up tank. The Sump Guard is attached to the engine block by rubber mounts, these are in effect screws joined in the middle by a section of rubber. The idea is in case of a bad collision with the a rock etc the screws do not snap off in the engine block, instead they break halfway on the rubber join. The problem comes in when one has crash bars which attach to these mounts as well. 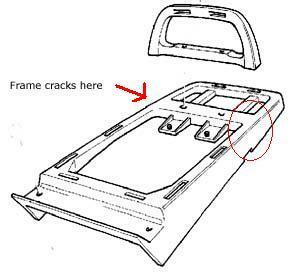 After nearly every heavy contact with the ground and certainly after every accident you will find that at least one of the rubber mounts has broken. ALWAYS CARRY SPARES OF THESE IF YOU HAVE CRASH BARS FITTED. In overlanding the use of crash guards is an absolute necessity. Be weary of using standard BMW Crash bars for your bike as these need to be fully removed every time you change your oil. 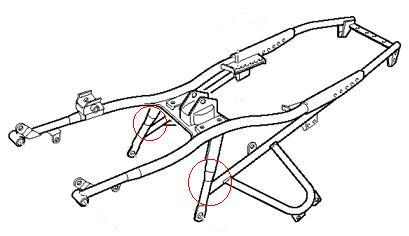 There are other manufacturers who make crash bars which can be disassembled just to change the oil. 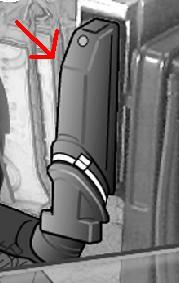 The frame on all the new GS models has a weakness and is prone to cracking at the junction of the three tubes as illustrated in the diagram alongside. The best way to prevent this is to weld a triangular piece of steel into the intersection of these tubes (highlighted). This will provide the extra strength needed for overlanding. The standard luggage rack supplied for the bike is not adequate for overlanding. The easy solution is to install the BMW mounting plate for its top box, this doubles as a luggage rack extension. The downside to this is that the part of the frame that this rack mounts to is aluminium and cracks under the stresses of off-roading. The way I have overcome this problem is by sawing off the luggage rack section of this frame and made a new luggage rack of tubular steel mounting it on the two pannier rack mounting points. 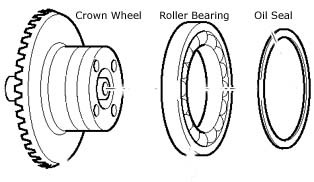 My bearing went at 40,000kms, Martin Rooiman's went at 77,000kms. Problems with are not even predicted in a 60,000 km service by BMW, always carry a spare bearing and oil seal. Tachometer cable - Carry a spare just in case. although Generic cables have been known to fit. Alternator Belt -My belt looked like spaghetti at 43,000 kms, my fault probably, I had never adjusted the tension, always do this. Spares are easy for this, it is a standard size for machine belts. 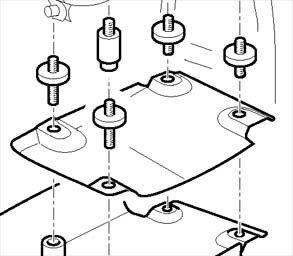 O-Ring for Oil Filler Cap - continuous leaking from Boxer engine oil filler caps means you should always have spare O-Rings for Oil Filler Caps. Spokes - I have gone through about ten spokes after 40,000 kms Always make sure you have at least 5 for each wheel. Tyres - always be aware of your next tyre change and your wear on the tyres, overlanding instead of town driving means your tyres will last longer, but how much longer depends on how you drive. I drive fast and I am on my third set after 40,000 kms. I recommend Bridgestone Trailwinds for 90 % of the roads surfaces I have seen. I had a very nasty experience with Michelin T66's. Windscreen - Givi Windscreen designed for the R1150GS. It keeps the noise out and permits longer distance riding as it reduces wind fatigue. It might crack on the sides after an impact, in this case drill tiny holes on either side of the crack and thread wire through and tighten for added strength, add loads of superglue as well. Most of the modifications I did to my bike were done by Touratech in Germany. Touratech Hard Parts for the front forks to prevent damage to the forks in a "tank slap"